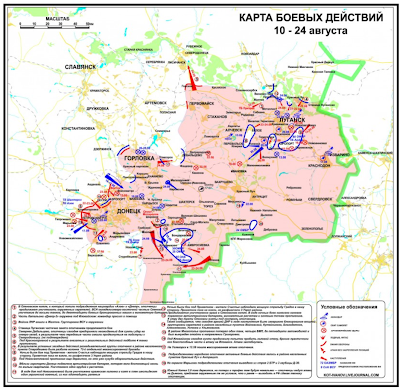 A lot has happened since Western media reported on August 13 that rebels in Donetsk were surrounded. Here is the map of major military operations from my August 13 post Multi-Pronged Attack on Donetsk Rebels Likely Within Days. Blue jets inside red circles are locations where Ukrainian military planes are confirmed to have crashed after being shot down. (This is only for the period of the map, August 1-10. Blue jets shooting into blue circles are locations of Ukrainian air raids, again just for the period August 1-10. Blue circles with "X" inside them are Ukrainian artillery strikes. Red circles with "X" inside them are rebel artillery strikes. Notice the completely different nature of the map. 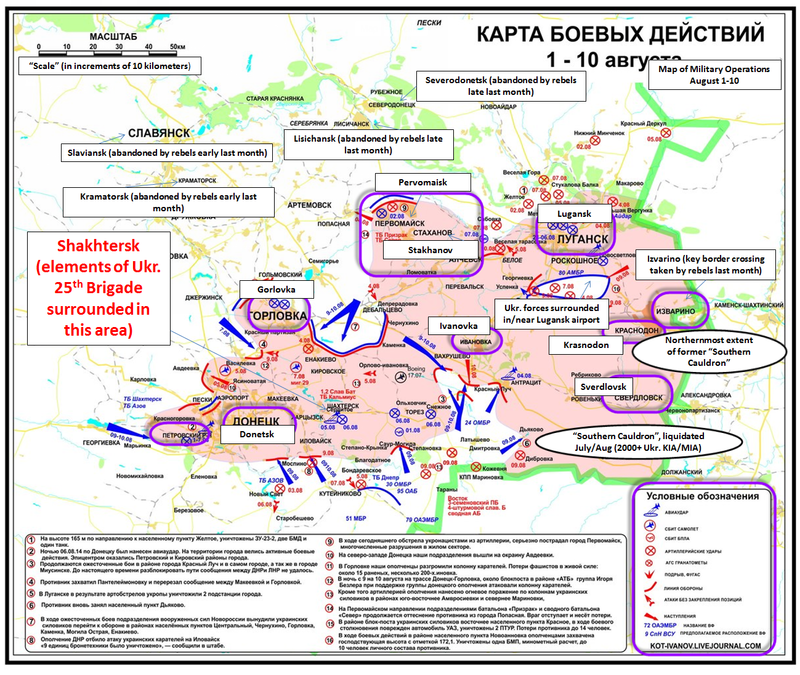 Seven areas in white show places where Ukrainian forces are trapped. On August 13, only one such occurrence. Note the surge in pink on the South end of the map. Colonel Casad reports Mariupol in Panic. Here is a Google translation. If a better translation comes in from Jacob Dreizin I will update this blog. August 25, Mariupol faced a wave of panic. People hastily leave the port city, which temporarily moved not only many of Donetsk, but also employees of Donetsk Regional State Administration Governor Sergei Taruta. Among the residents are rumors about that tomorrow units from the DNR [Donetsk People's Republic - aka rebels] will take the city. "At first we wanted to check in Dnepropetrovsk, but there, they say, the city is already overcrowded refugee housing even money can not you take off. Let his family to go somewhere in the center of the country, where - still do not know. Stations today are simply full of people with trunks all say that tomorrow will be in the DNI "- said,"Vesti "Valery from Donetsk. Fighting near Novoazovskiy, cutting the track Novoazovsk-Mariupol, fighting under Sedov, all this caused a hysterical reaction and began to flee the active supporters of the junta in Dnepropetrovsk. And at the junta here considering escaped from under Ilovaysk punitive battalion "Azov" can have up to 800-900 armed men, and most likely they seriously outnumber militias operating on the outskirts of Mariupol and Novoazovsk. But the suddenness of the threat against the background of low morale parts junta in this sector, generating strong panic in the media and among the local population, who spreads rumors about the imminent surrender of Mariupol and new bumps DNR. In this regard, the panic on the one hand can stay as episodic panic and lead to more serious consequences if local forces junta will not disband before the real and the fictional threat to assault Mariupol. However, the question itself that can be taken Mariupol DNR, says very clearly about how events have changed in the Donbas in recent days. This breakthrough in Mariupol may be in addition to the military and political implications. In reaching agreement with Akhmetov, control Mariupol will mean that the new state will remain unrecognized large and untouched by the war industries, and Akhmetov will make any effort to restore the ruined DNR. And a special update on break through Uspenka south to the Sea of ​​Azov. He certainly looks risky because the flank along the border is subject to shocks from the west and it is fairly easy to cut blow mechanized units. And in other circumstances it would have looked like a blatant bit of a gamble zasovyvanie 3 brigades of the junta to the first southern boiler. 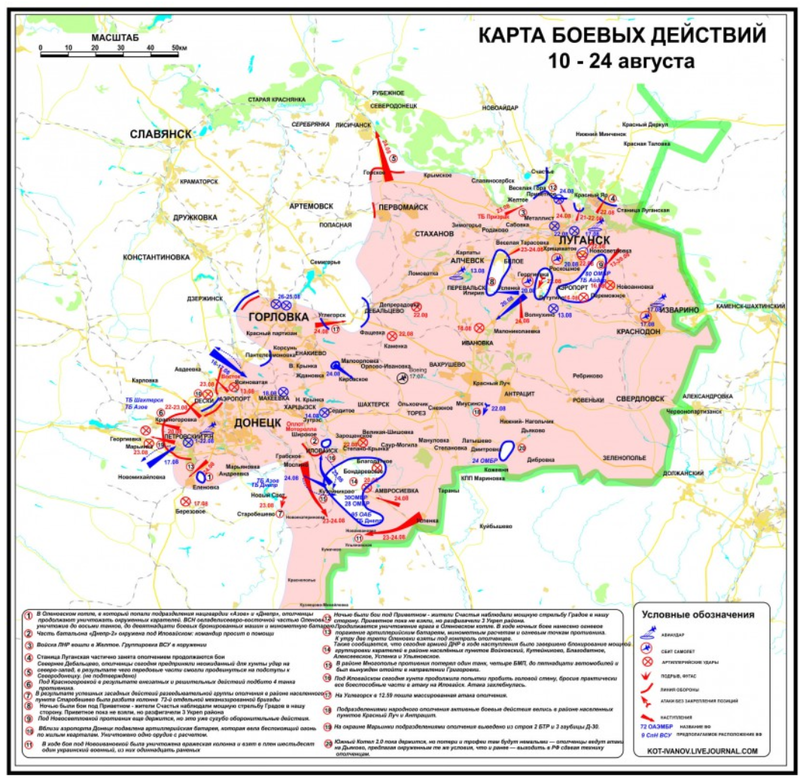 But as reserves in the junta is not here, and for transferring them from under Perekopa take time (and in this case they need to fight for Amvrosievka), the militia here are offensive in-vacuum (the enemy simply do not), which brings them to the outskirts of Novoazovsk and approaches to Mariupol. Therefore, proper and panics junta commanders and residents of Mariupol - before them rend serious operational crisis to which they were completely unprepared. And for its localization requires time and that the most important reserves. Do hosts here have a few days of his winning time, which you can try to convert the captured city, trophies, military and political successes. At the same time, do not underestimate the junta, it there are certain forces for the defense of Mariupol and if the junta decides to defend the city, then take it is not as easy as it is to someone might appear in the wake of recent successes. Naturally delighted with our success, we should not indulge in excessive euphoria, the enemy had not yet broken and panic are not talking about the final defeat, and that he is with bewilderment and confusion from happening. PS. Our source in Mariupol reports people are in panic at the pump line to get out of town. In Mariupol there is no reason to panic "- said Taruta (Governor Don.obl), sitting in the helicopter. As reported (to be confirmed) in the city is evacuated administration Gauleiter Taruta - take out then, whether in Dnipropetrovsk, then, whether in Kiev. Looking for a more credible source for essentially the same information? If so, perhaps the well-established Ukrainian news site Vesti will suffice. In the Donetsk region fighting continues, however, according to recent reports, the battle moved to the south of the region. Resources DNR reported that there are fights under Volnovaha and in the battalion "Dnepr" say that the fighting is taking place in the village Markino. Vesti also reports Mariupol in panic because of the possible capture of the city by DNR. Curiously, people blame me for these reports. They challenge the alleged biased nature of the maps, even though the first map highlighted a possible Ukraine army surge. My statement from yesterday stands "If these reports are accurate, the Ukrainian forces are in serious trouble." That is not a pro-Putin statement, a pro-Russia statement or anything of the like. It is a simple statement of fact. That said, I do find these sources more credible than anything coming from Ukraine, the Financial Times, or Western mainstream media. Once again, here is a map of the area around the Sea of Azov (also shown yesterday). 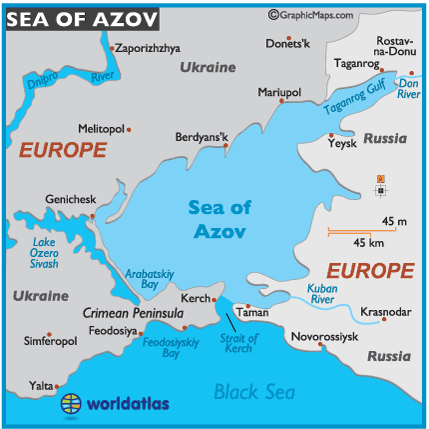 "The Sea of Azov, a northern extension of the Black Sea, is located on the southern coastlines of Russia and Ukraine. Though somewhat difficult to navigate because of its shallowness, significant levels of freight and passenger traffic do flow through the port cities of Berdyans'k, Mariupol, Taganrog and Yeysk." I believe the tide in this war has changed in a massive way, and it will change even more if rebels take Mariupol as now appears likely given the scale of recent rebel advances. The war was supposed to be over in May, in June, in July, and in August. Is it over yet? Is it even close to being over? Are the rebels surrounded or are Ukrainian forces trapped? When do people stop believing lies from Kiev? Was the battle against Federalism worth it? Was the destruction in Donetsk, Lugansk, and other places a "small price" in the name of unity and peace? To whom?